With the help of Brittany from The House That Lars Built, we’ve gotten into the holiday spirit! As the final tutorial of our holiday series, we have a unique gift wrap for you to try on your beautiful presents. If you’re like me you will be wrapping a lot of gifts this holiday season. I like to change up my gift wrapping techniques to keep things interesting. I’ve wanted to try my take on the Japanese Furoshiki fabric gift wrap technique for a while now, so I decided to use this festive Laura Ashley fabric to finally do it! I also added a fabric “poinsettia” topper, because how could I not? Materials: Laura Ashley Fabric (we used the Highland Check Cranberry fabric), scissors, glue gun, straight pins, needle, thread, gift to wrap. Cut your fabric into a square or rectangle large enough to generously cover your gift box on all sides plus a little extra room to make a knot on the top of the gift. 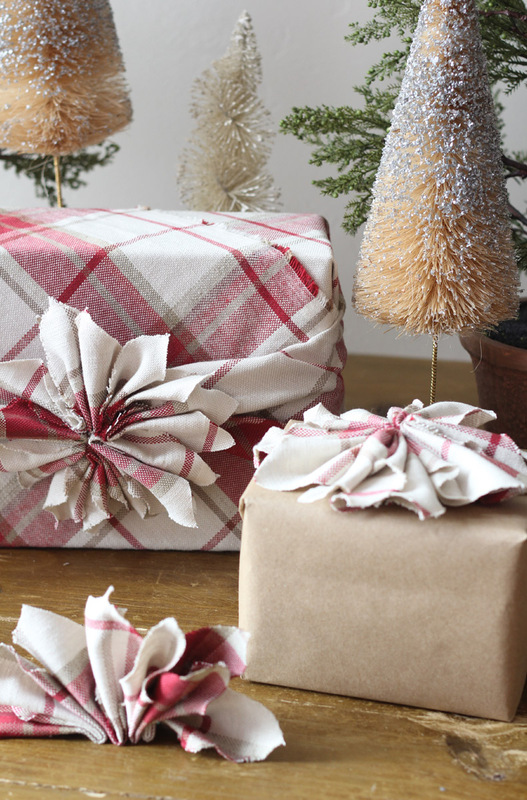 Place your gift box in the middle of your fabric at an angle. Bring the bottom corner of the fabric up over the gift and tuck it under the box. Bring the top corner of the fabric down over the gift and use a little hot glue to glue it in place on the bottom of the gift. Tuck and fold excess fabric on each side of the box at right angles as you would when wrapping a box with paper. 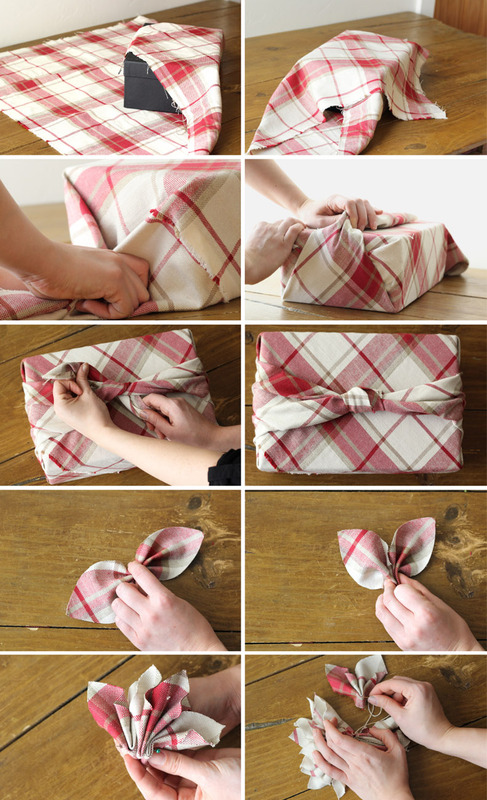 Bring excess fabric from each side to the top of the box and tie in a knot. Tuck the tails of the knot under and secure with a few dots of hot glue. Use the poinsettia template to cut 8 petals. Pinch a petal in the middle, and then fold it in half to form 2 petals. Run a needle and thread (knotted on one end) through the fold in the petal. Repeat with the rest of your petals. Once all of the petals are strung onto your thread, run the needle and thread through the first petal to form a complete flower. Knot and cut your thread. 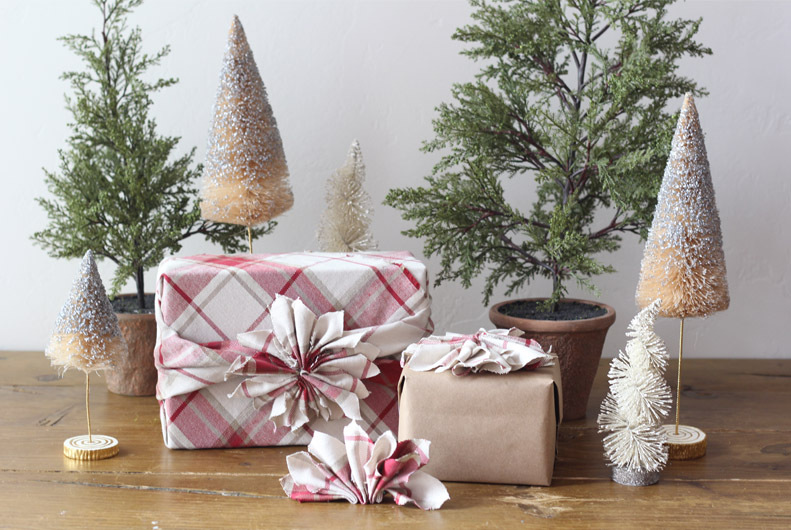 Use hot glue to attach the flower on top of the knot on your wrapped box. This gift wrap is a great option for when you have a bit of extra yardage to use. You could also use the smaller pieces of fabric to create a flower to place on top of a plain paper package. However you decide, have fun with your holiday gift wrapping! 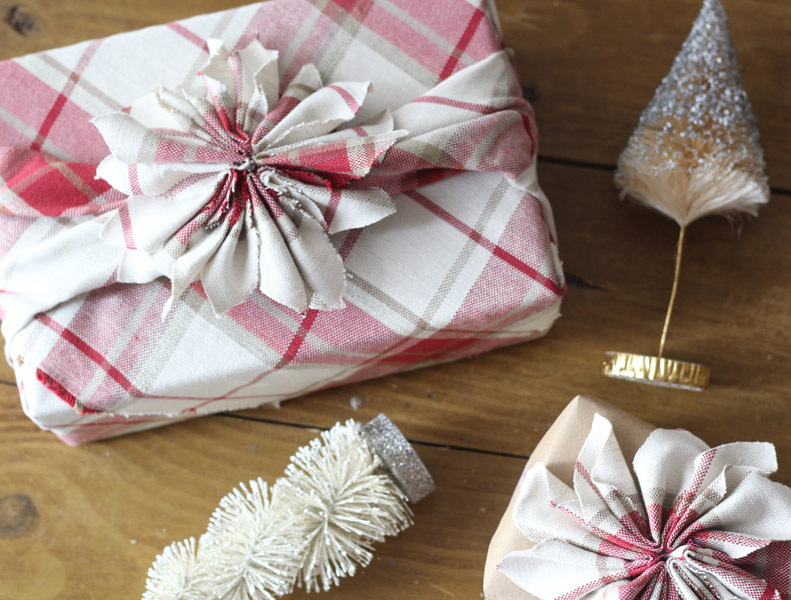 We would like to see your gift wrap! Tag us on Instagram @LauraAshleyUSA. 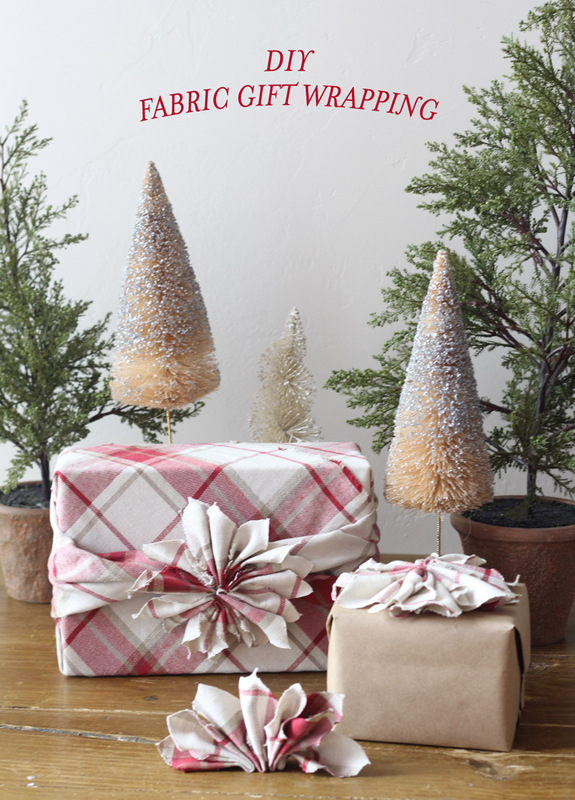 This entry was posted in Make & Do and tagged brittany jepsen, christmas, Christmas craft, crafting, diy, fabric, festive, gift giving, gift wrap, gifts, Highland Check Cranberry Fabric, holiday, Make & Do: DIY Fabric Gift Wrapping, presents, red, the house that lars built. Bookmark the permalink.